Everything has its end. Your roof shingles are no different, and you will have to replace them at some point. There are some basic things to look for to see if you need to replace some of your roof shingles. There are many types of roof shingles, or roof tiles. They vary in weight, appearance, durability, and of course, cost. The first issue to look for are problems caused by improperly installed roof shingles. 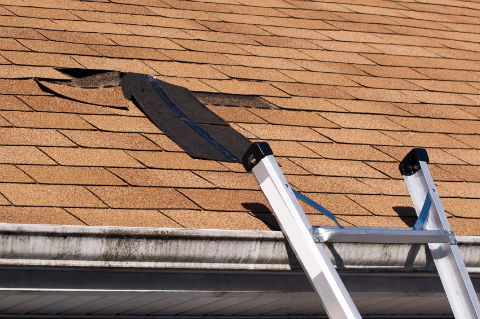 If you see signs of slippage or missing shingles, contact a qualified roofer for an inspection. Check if your roof tiles are still under warranty. Extreme weather can cause asphalt roof shingles to fly off (especially if improperly installed), and heavy hail can break clay and slate roof tiles. Broken or cracked roof tiles can also be caused by being walked upon. In this case, you can likely replace just the problem tiles. Age is of course a problem with all roof shingles. Asphalt will curl up and lose its granules. Slate will delaminate over time, meaning they become more porous. Age is a reason to replace your roof entirely. Rubber and metal roofing is extremely durable during its lifetime, and will likely only crack if improperly installed or if poorly maintained. You should regularly inspect your shingle roof. Prevention is key when it comes to ensuring a long-lasting and effective roof. There is no reason to replace your whole roof before you have to. A ground inspection is important to evaluate the entirety of your roof, as problems concentrated in one area of your roof may indicate a structural problem, not a roofing one. However, many problems can only be seen upon closer inspection. Do not walk on your roof, especially if it has a steep slope, or if it is covered with tile or slate (unless you want to replace your roof early!) Just use a secure ladder to view your roof from various angles. Even a few broken or cracked roof shingles can cause serious problems. As soon as you notice damage, contact a qualified roofer for an inspection. It is better to prevent expensive water damage early on, rather than wait until you have to replace your roof entirely.